Analyze human bone, artifacts, and rocks. 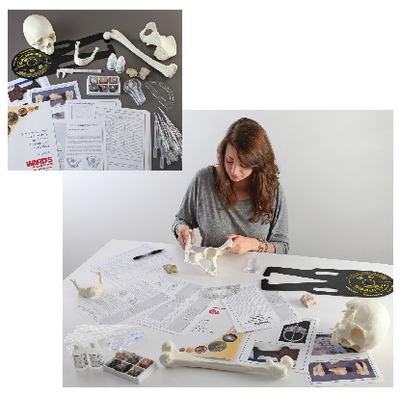 In this forensic science activity, students will apply hands-on forensic techniques to analyze a scenario involving multiple lines of anthropological, archaeological, and geological evidence from human bone replicas, artifact photos, and rocks. A human skeleton found in the woods in northern New York and associated artifacts and rocks suggest a possible Viking burial. But is it? Or is it a creative cover-up for a murder scene? Three student teams work together to analyze the evidence, reconstruct the scene, and determine if a crime was committed and, if so, the identity of the perpetrator. This detailed and fascinating study of bones and stones was developed in collaboration with Tyler G. O’Brien, Ph. D., Associate Professor of Anthropology at the University of Northern Iowa, and Neal R. O-Brien, Emeritus Professor of Geology at SUNY at Potsdam, for students in high school and early college. The activity can be completed in four 45-minute lab sessions with additional research time outside of class.